15/2/2019 - Gravel in place with concrete walls about to be constructed. 14/12/2018 - General earthworks have commenced. 8/11/2018 - Letters advising of the start of construction are being delivered to residents who live within a 100m radius of the site. Please check your letterbox. You can also view the letter here. A new rain garden will be constructed in an urbanised area in Karabar. With a total treatable area of 950 square metres, it will filter and clean water diverted from nearby pipes before returning it to the stormwater system. Approximately 27,500 kilograms of suspended sediment, nitrogen and phosphorous will be removed every year from stormwater bound for the Queanbeyan River. The rain garden is the 17th of 20 ACT Healthy Waterways infrastructure projects and the only one located outside the ACT. It is bounded on all sides by homes and streets and constrained by overhead powerlines, existing stormwater pipes and underground services. It is also positioned within an existing overland flow path which diverts and moves water during major storm events. For this reason, the design ensures that flood capacity of the space is not reduced. ACT Healthy Waterways identified this site as a priority early in the project as it is upstream of the Molonglo River, Jerrabomberra Wetlands and Lake Burley Griffin. An existing cycle path will be relocated to the east. ^Water plants in particular may take up to two years to establish. The length of time may vary depending on ground and weather conditions. During the establishment period, flows into and through the asset will be managed to suit the conditions and to protect and nurture the plants. Kenneth Place rain garden removed due to insufficient area and clashes with underground services. Replaced with stormceptor underground treatment unit. 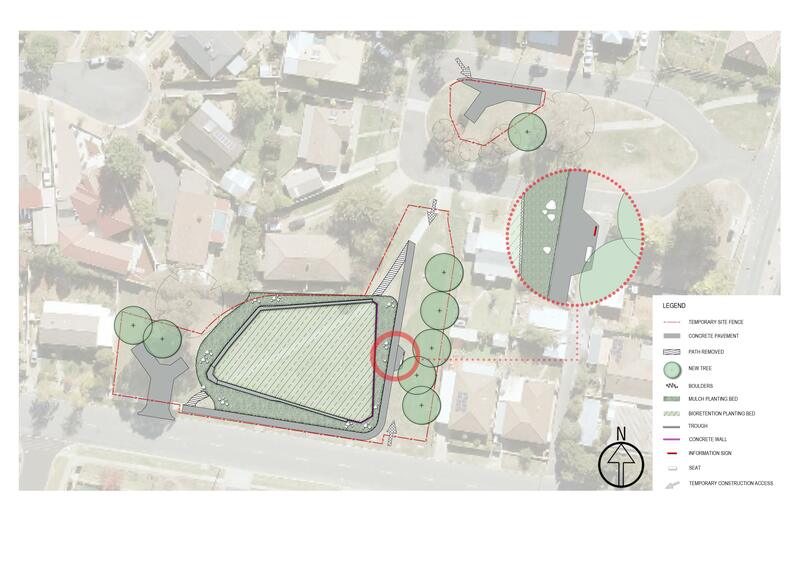 Shape of southern rain garden adjusted to suit detailed survey. Above ground sediment bays deleted due to proximity to public, additional capacity built into underground pollutant trap instead. Adjustments made to driveways and service vehicle access arrangements to improve safety. Diversion pipe removed from Lily Place/Kenneth Place alleyway due to change to underground treatment in Kenneth Place.